As an INAM reader, I’m sure that you’re aware that I attend a lot of food-related events each year. 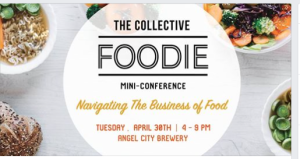 So this Collective Foodie Mini-Conference on April 30th is right up my alley! And since just about everyone I know is also a foodie, I assume it will be up yours, as well. But this one may turn-out to be even better than most because it’s not just a scarf-down-and-run experience—it’s a learning one! I’ve been to the last two business conferences put on by The Collective, and got so much out of the experiences. (You can read all about them here: itsnotaboutme.tv/news/event-the-collective-conference, and here: itsnotaboutme.tv/news/event-the-collective-conference-2018.) So I’m really looking forward to this one from that company, which concentrates on the food industry. 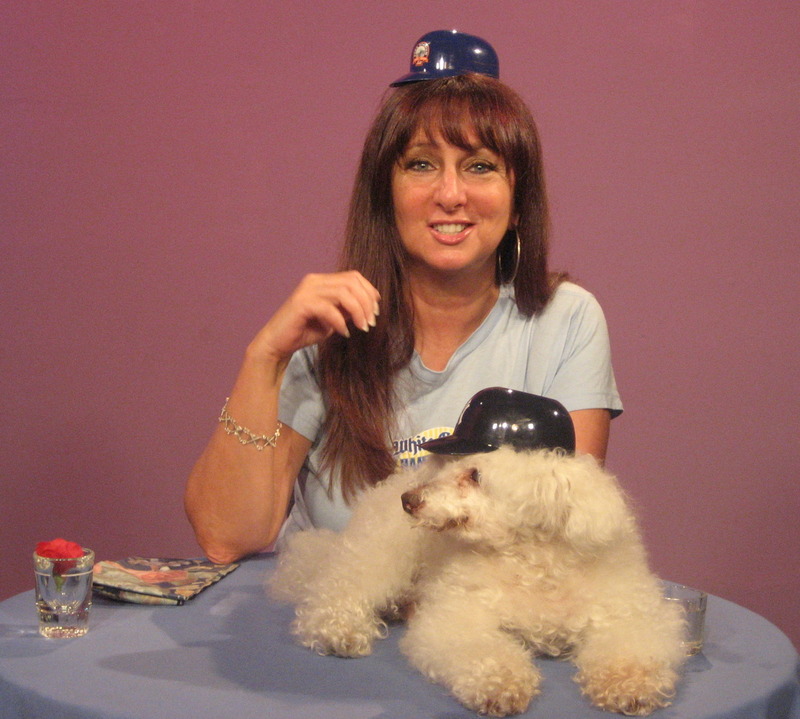 Karen Salkin on Karen’s Restaurant Revue, with her co-star, Clarence, The Singing Dog. This pic doesn’t look like it has much to do with food, but the little baseball helmets they’re rocking had ice cream in them originally, and her shirt says “White Castle.” Photo by Mr. X. As those of you who’ve followed me from television to print know, I was mainly a restaurant critic on my TV show, Karen’s Restaurant Revue, for many years. But, due to its popularity, I started getting invited to all kinds of events, for which I’ve been eternally grateful. And since I’m never just a taker, and always try to give back, I discussed all my escapades on my show. And those reviews made me also be considered a theatre, film, beauty, fashion, sports, and culture critic. Who’da thunk it? All that led to this e-zine, which features about four dozen topics, so restaurant reviewing has, sadly, moved down the ladder a bit. But it still has my heart. If I had my druthers, I’d eat at every restaurant in the world! (And share it all with you guys, of course.) So I’m eager to refresh my eatery knowledge at the Collective Foodie conference at the end of this month. After having been regarded as one of the top Los Angeles restaurant influencers for so long back in the day, (before we were even referred to as “influencers,”) it will be a pleasure to be to the recipient of the knowledge of others who are now at the forefront of the business! I’ll enjoy being the student this time, and not the teacher. Some of last year’s snacks. Photo courtesy of the Collective Foodie. 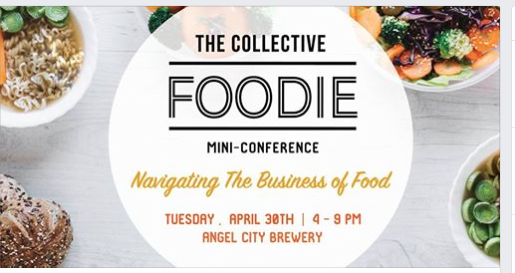 The organizers of the Collective Foodie tell me that this event will feature “over fifteen speakers, three keynotes, two panels, and three networking sessions.” And, of course—food! Duh. My literal appetite is whet to sample fare from different eateries there, and my figurative one to discover just how much the culinary scene has changed since I was primarily a restaurant critic. I understand that we’re going to learn about the latest innovations, especially where digital marketing trends are concerned. That’s a topic I’m often confused about, so I can’t wait for that enlightenment. The topics at the conference will include how to monetize those foodie photos we all take, which is something I’ve wondered about. At food fetes, my team and I take a few pix of a dish, which takes about a nano-second, and then we pass it on. And we often notice that the next guests take their photos, complete with lights and camera-holders, for five minutes! Hopefully, I’ll now learn how (and why!,) to do that, too! Angel City Brewery–the venue for the Collective Foodie. This is the conference’s third year, but it’s only the first time that I’ve heard of it. So now none of you will have to miss out on it this time, either, because I’m giving you advance notice! I wouldn’t want any of us to not be in the know ever again. 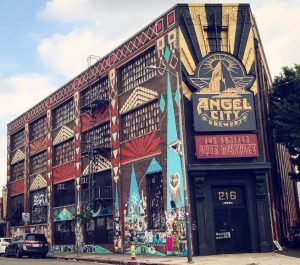 It all takes place at downtown LA’s Angel City Brewery, which I’ve never been to, so I’m especially curious about it. And I have a feeling that means that lots of comped beer is involved, for you imbibers! 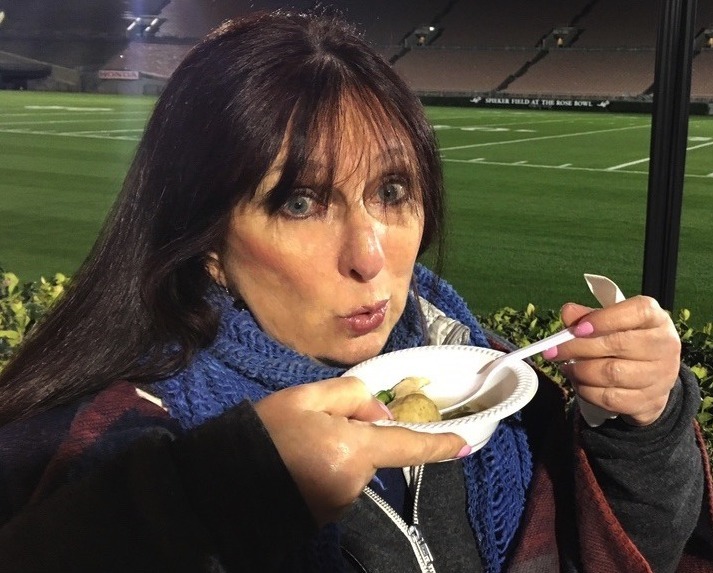 Karen Salkin, honing her food-tasting skills for the 2019 Collective Foodie! Photo by Lisa Politz. After more opportunities for knowledge, the evening will end with a Foodie Lounge. My mouth is watering for that part right now! And we will all get to mingle and discuss what we just learned. And—wait for it—we all leave with foodie swag bags! So, whether you’re a food blogger, a “foodpreneur,” a food expert, or just a plain old appreciative food consumer, (which aren’t we all? 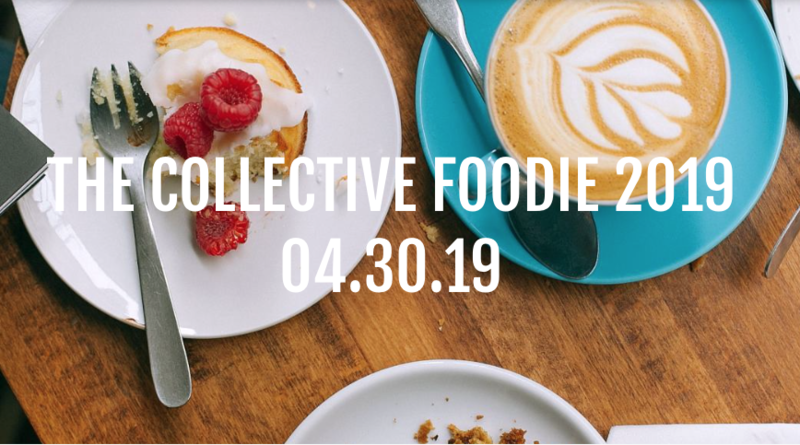 !,) the Collective Foodie is the event for you! What a fabulous way to close-out April!